Does a Kiwi Turn Brown? Sliced bananas brown quickly, unless they're dipped in lemon juice or other acids. 3 Can You Use an Eggplant if It Has Rotten Spots? 4 Does a Kiwi Turn Brown? Anyone who has ever mixed up a fruit salad knows that many fruits -- peaches, pineapples, grapes, cherries, mandarin oranges and more -- obligingly retain their texture and color when cut. Other fruits, including apples and bananas, do not. 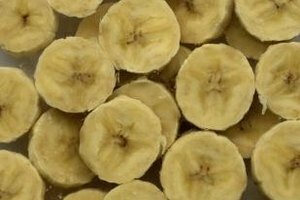 Bananas are among the fruits that discolor and soften most quickly. One way to slow that reaction is to dip them in lemon juice. These browning reactions are caused by phenolic compounds found in some fruits and vegetables. These are plant-based phytochemicals with a number of positive benefits. They're powerful antioxidants, and they provide plants with colors, flavors and powerful protection from pests. The browning reaction is a form of pest protection. When you cut the fruit -- or when an insect pest bores into it -- enzymes in the fruit react with oxygen and those phenols. The resultant chemical brew breaks down the fruit's own flesh, but it has a similar effect on any intruding insects. You can minimize fruit browning in several ways. Dried fruits are treated with sulfur to help retain their fresh color. The browning effect is most rapid at higher temperatures, so refrigerating susceptible fruits and vegetables can help. That's not a good option with bananas, which are easily damaged and discolored by cold. Immersing the fruit in cold water helps by limiting its exposure to oxygen. Acidity is the best counter of all, because the enzymes' chemical reactions work poorly in acidic conditions. That's why cooks and bakers often coat cut fruit with lemon juice. If you're cutting whole bananas into short sections for a lunchbox, dipping the cut end into lemon juice will prevent browning for several hours. It will also work with peeled and sliced bananas, though this creates a second problem. Lemon juice has a distinctive flavor of its own, and it's intensely sour. If there's too much lemon juice on your banana slices, they'll taste more of lemon than banana. Professional cooks preparing bananas in bulk usually dilute the lemon juice with water, and store their cut bananas in the mixture. The bananas benefit from both the immersion and the acidity. Lemon juice is usually the most practical choice for acidifying the cut bananas, but it's not the only option. Sweeter fruit juices, such as pineapple, orange and apple juice, are acidic enough to prevent browning without needing to be diluted. Apple juice is mild enough to be almost undetectable on the bananas after they're drained, but the others should only be used when the bananas will be mixed with other fruit. A mild solution of ascorbic acid -- also known as vitamin C -- in water also works well. Packages of ascorbic acid are sold in supermarket produce sections, or you can simply grind up vitamin C tablets as needed. Why Won't Food Turn Brown If I Put Lemon Juice On It?